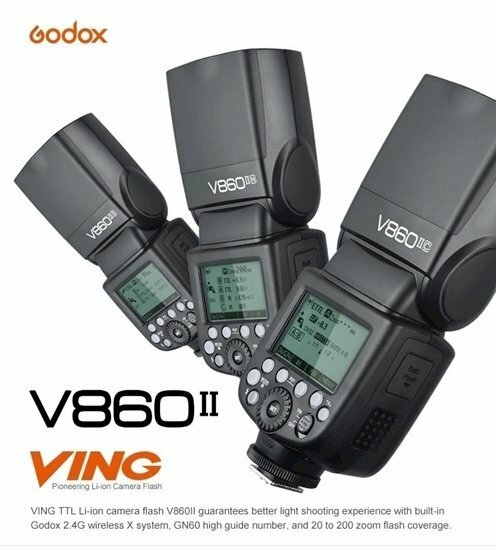 Power, speed, and integrated radio transmission make the VING V860IIO TTL Li-Ion Flash Kit from Godox a hard-to-beat option for your Olympus or Panasonic cameras. Fully compatible with ADI / P-TTL systems, the V860IIO supports many advanced functions and features. Also, it features the Godox 2.4GHz X wireless radio system which provides both master and slave TTL functionality with a range of up to 328'. On top of this, the flash is powerful and versatile, featuring a guide number of 197' at ISO 100 and 200mm along with a zoom range of 20-200mm, which can be expanded to 14mm with the use of the pull-out panel. And, this flash runs off a rechargeable Li-ion battery pack, that ensures fast recharge and long-lasting shoots. For general operation, the V860IIF features full bounce flash capabilities, including tilting from -7 to 90° and rotation left and right 180°. As TTL compatible unit, this flash offers support for high-speed sync, flash exposure compensation, 1st and 2nd curtain sync, and much more. Additionally, it can function as an optical master or slave unit if needed. The Godox 2.4GHz X wireless radio system has an impressive range of 328' along with the ability to choose between 32 channels and set up three groups. The system is compatible with Godox's X series or transmitters for more advanced functionality and setups. A powerful guide number of 197' at ISO 100 and 200mm ensures your subjects are properly illuminated. A zoom range of 20-200mm, as well as a wide-angle panel that supports 14mm, ensures maximum compatibility with a range of lenses and shooting styles. The flash head can tilt from -7 to 90° and rotate 180° both left and right for full bounce capabilities. Optical wireless transmission is available with access to four channels and two groups as well as a range of up to 49'. An AF assist light is present with a range of 2-32.8'. This flash supports various functions, including multi flash, high-speed sync, 1st and 2nd curtain sync, flash exposure compensation, and more. The 11.1V, 2000mAh Li-ion polymer battery pack included with the flash will provide recharge times of faster than 1.5 seconds and approximately 650 full-power flashes. In addition to the hot shoe and wireless triggering, the V860IIF offers a 2.5mm sync port for a wired connection to a camera or receiver. A micro-USB port is available for installing firmware updates.